Imagine this scenario: You’re in September in your fantasy league and your best batter has to face the rotational power of the Philadelphia Phillies, the Milwaukee Brewers, and the San Francisco Giants. Your opponent’s best batter gets to face the Texas Rangers, Kansas City Royals, and Cleveland Indians. Advantage: your opponent. At this time of year, as fantasy competitors start thinking about player valuations headed into draft season, most people don’t think about match-ups. But thanks to some recent transactions this MLB off-season, perhaps they should. Some of the game’s top starting pitchers including Zack Greinke, Cliff Lee, and Shaun Marcum have signed or been dealt from American League teams to National League teams. Some of the game’s top hitters including Adrian Gonzalez and Adam Dunn have moved the opposite way, from National League teams to American League teams. The National League has always been more hospitable for pitchers. NL pitchers get to face opposing pitchers in the lineup instead of a designated hitter. In each of the past 10 years, NL batters scored fewer runs per game than AL batters. (See chart). But now, the NL is also home to many of baseball’s top starters. According to data on FanGraphs, 20 of the top 35 pitchers in WAR last season reside in the NL. On ESPN’s recent player rankings in fantasy baseball for the upcoming season, 17 of the top 25 pitchers belong to the NL. Recent moves mean that not only will AL batters not have to face pitchers like Greinke and Lee on a regular basis, they’ll enjoy match-ups against their replacements. Opposing batters going into Kansas City, for example, will see a rotation that looks like this: Luke Hochevar, Kyle Davies, Vin Mazarro, Sean O’Sullivan, and an undetermined fifth starter. Meanwhile, NL batters will regularly see fearsome rotations. We already know Philadelphia’s new rotation is stacked, and the San Francisco Giants’ rotation has proven themselves on the road to a championship in 2010. Now the Milwaukee Brewers also have an excellent staff. And watch out for the mighty prospects soon to be pitching in the Atlanta Braves’ rotation – to go along with the already very solid core of Tim Hudson, Tommy Hanson and Jair Jurrjens. All things being equal, it’s always been a good idea to draft NL pitchers over AL pitchers, thanks to the advantages of no designated hitter and inferior hitting talent. Now, those who play in mixed fantasy baseball leagues have to ask themselves whether it’s time to bump up AL batters too. 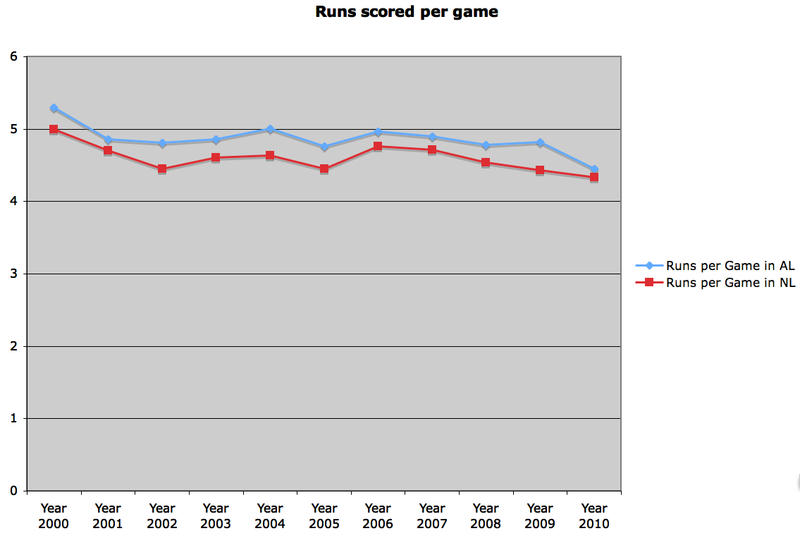 We may begin to see the difference between runs scored in the two leagues grow even more.